Join us for a Pillow Bar trunk show the weekend of April 21. We had so much fun in September, we had to do it again! This time, we’ll be featuring Mother’s Day, graduation and bridal gift ideas – to be personalized with TLC in time for your occasion. 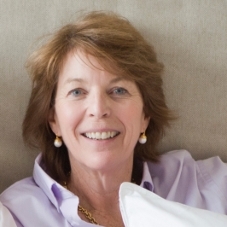 Merrimac founded The Pillow Bar in 2008. While seeking to help her husband recover from debilitating back surgery, she couldn’t find a pillow worth its weight. So, she spent more than a year working with chiropractors and surgeons, seeking to create the perfect pillow. The name ‘The Pillow Bar’ refers literally to a bar. Merrimac invented a patent-pending, mechanized bar that is used to efficiently fill pillows according to custom specs. Pillows are filled according to a customer’s unique size, shape, and sleep preferences. Nobody does what The Pillow Bar does. From boomerang shaped "side sleeper" pillows to ribbon wrapped travel pillows, The Pillow Bar offers something for everyone. Each pillow features fine Hungarian down (or down alternative) as well as an embedded lavender sachet. 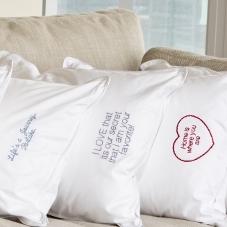 Every item – including sleepwear, towels, and more – comes standard with a custom embroidered message and/or monogram. Merrimac will be at our store all day on Saturday, April 21st, possibly the 22nd as well. Meet with Merrimac and get custom-fitted for your own Pillow Bar pillow, in person. To ensure one on one time with her, we are currently taking appointments. This entry was posted on Tuesday, March 20th, 2018 at 5:06 pm	and is filed under Official Updates. You can follow any responses to this entry through the RSS 2.0 feed. You can leave a response, or trackback from your own site.